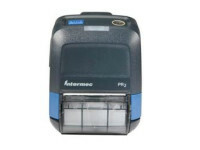 Intermec’s PB42 four inch wireless portable receipt printer is designed to improve direct store delivery (DSD), Field Service, and Home Utility applications. 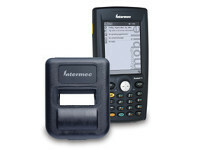 The Intermec PB42 printer interfaces seamlessly with the Intermec CK60 and Intermec 700 Intermec handheld computers. Daily route activities are easily entered and tracked via a mobile computer throughout a workers shift. Receipts are immediately provided to the customer for prompt payment or to eliminate duplicate billing efforts. 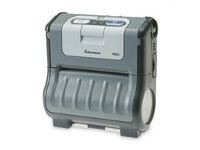 The unique Intermec design of the Intermec PB42 portable receipt printer ensures ease of use. This is very important for delivery drivers who negotiate routes with multiple stops and rugged conditions. Special design features include sharing of battery design with the CK60 mobile computer, simple receipt paper installation, high visibility buttons and indicators to show when the printer is within radio range or when the lithium ion batteries are getting low. Charge up to four printers at once with the unique four bay charger. Printers “drop-in” and charge from hinge pins; no charge cable required. Frontloading batteries that can be removed with just one hand. Lexan® media windows conveniently show media status. Standard belt clip & hand strap also add to the convenience of operation. The Intermec Ready-to-Work Indicator is integrated into the Intermec PB42 printer. This is part of the Intermec SmartSystems™ and provides a visual cue to the operating state of the printer. 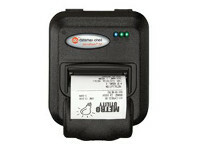 Intermec’s PB42 portable receipt printer is ideal for use worldwide. The Intermec PB42 printer features widely recognized international logo indicators on the buttons, multiple language character sets, and worldwide certifications. The Intermec PB42 printer is ideal for streamlining processes and route deliveries in DSD, field service, and home utility industries worldwide. • West European Latin No. 1 and 9: Danish, Dutch, English, Faeroese, Finnish, French, German, Icelandic, Irish, Italian, Norweigian, Portuguese, Spanish, and Swedish. • East European Latin No. 2: Albanian, Czech, English, German, Hungarian, Polish, Rumanian, Serbocroation, Slovak, and Slovene. • Cyrillic: Bulgarian,Byelorussian, English, Macedonian, Russian, Serbocroation, and Ukrainian. 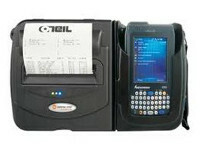 Log onto www.intermec.com for additional international fonts for the PB42 portable printer. Voltage Range: 12 V ± 5%. Rechargeable Li-Ion Battery: 7.2V, 2.4A-H. Each printer ships standard with two batteries (batteries do not ship with vehicle mount option).